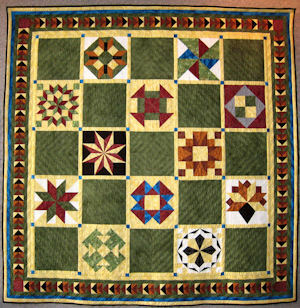 Green County Barn Quilt Sampler 1 This quilt was designed with the intention of keeping the blocks as true to the colors painted on the barns as possible. I chose a color scheme and created the quilt you see before you. It contains 12 blocks adorning barns throughout Green County. I am often asked “Why do you quilt?” This should be a very simple and easy question to answer, but it’s not. There are many reasons why I quilt. As a child, I loved quilts that my parents had that their grandmothers had made for them when they were children. By the time I was 10 I had gotten those gorgeous quilts out of the linen cabinet and put them on my bed. Those beautiful quilts didn’t belong in a cabinet; they needed to be out and loved. Today, even worn and retired from everyday use, they remain my first connection to important women from my past, women I never had the opportunity to meet. They are my first connection to a craft that has significantly influenced the course of my life. 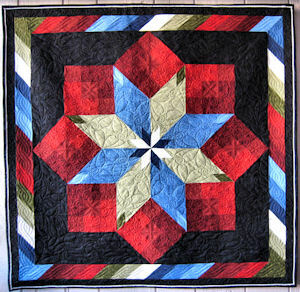 I quilt because it offers me a significant creative outlet. I don’t draw or paint, but I do see how shapes and colors can come together to be something so much more than the sum of its parts. I enjoy the challenge of balancing warm and cool colors or creating a piece of art that invites you to continue to look at it without growing tired or complacent. I enjoy the puzzle of figuring out the most efficient way to put all of the pieces together. I can put a little piece of myself into each of my quilts through the choices I make regarding the colors, the fabrics, the pattern, and the quilting itself. I quilt because it’s therapy. When life gets too real and I want to shut out the world, forget my troubles, and take a break from the challenges of the day, I can lose myself in the rhythm of the feed dogs pulling the layers through the sewing machine. I must be in the here and now, I must pay attention to what I am doing, but if I stay focused, I am rewarded not only with functional artwork, but with relief from my troubles, even if only temporary. Green County Barn Quilt Sampler 2 I like to call this the Badger Barn Quilt. The blocks for the quilt were chosen based on the colors painted on the barns. 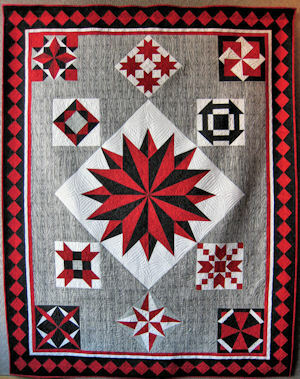 I took all of the blocks that were red, black, white and gray and arranged them into the quilt you see hanging here. It contains 11 blocks hanging on barns throughout Green County. 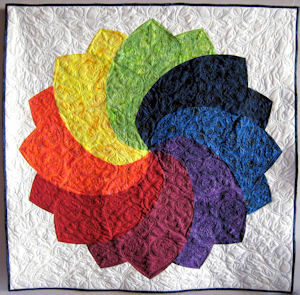 Rainbow Blossom This Rainbow Blossom block is a variation on the traditional Giant Dahlia quilt block, which gained popularity in 1930s. Ultimately, there is one reason that trumps all of the others. I quilt because I love my family. Like my grandmothers before me, I can give my family a piece of myself disguised as a blanket that they can wrap themselves in to stay warm and know I love them. I quilt because I want to be able to give them a hug even when I can’t be there. They will always be able to wrap up in their quilts and know that they can rest easy as they are safely being held in my warm embrace. Tree of Life This Tree of Life block has 103 pieces, not including the setting triangles or borders. That would be quite a few pieces to fit into a 12” block, which explains why I chose to make this barn quilt an enlarged stand-alone piece. 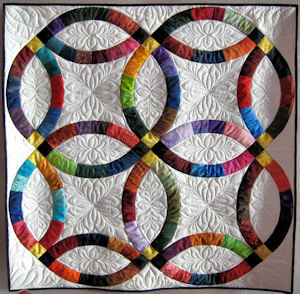 Double Wedding Ring The Double Wedding Ring gained popularity in the 1930s and remains one of the most recognized quilt patterns today. Amish Rubik’s Cube The Amish are well-known for using solid colors in their quilts, particularly black. I chose to make this quilt block with tone-on-tone fabrics based upon my preference for the subtlety and visual interest created by the pattern. 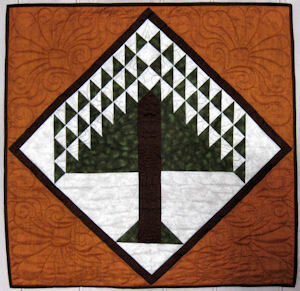 Barbara Hartman has used the barn quilts of Green County, Wisconsin as her inspiration.